We made a quick family trip to Wisconsin over the Labor Day weekend in order to visit family and friends. Visiting, swimming in the hotel pool, going to Mass at a Basilica, and spending some time at the lake were highlights of the weekend. I found a way to make Homestead Dad gear available. Check out this link, or find the new page on the website. We were able to go on a trip to Greenfield Village with all the kids, my mom, and my nephew. I did a review on this cane pole years ago. Here it is in action. Yesterday was a really good day. Spent a lot of time with the kids doing various things, including finished painting the front of the barn blue. 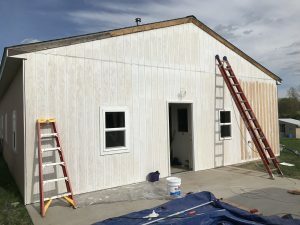 On Wednesday we were able to get the siding finished on the front of the barn. That included getting the two windows and the new entry door installed. We still need to reinstall the flashing on the peak, give it one more coat of primer in the channels of the siding, and give it one coat of paint. It was amazing how much primer the siding soaked in. Even after two thick coats, it still hardly looked like we did anything in some parts. On Thursday, we had co-op, so I was unable to help at all. We were wondering if any work was going to be done based on the weather report. 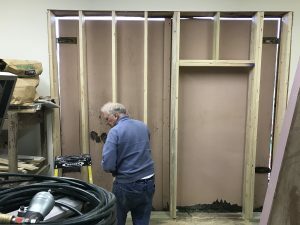 But my dad and his friend had the ingenious idea of reversing the barn doors on their hinges so that they were on the outside of the barn footprint so they could work on framing the new wall and door entry. By the time we got home from co-op the wall was framed and ready for girts. 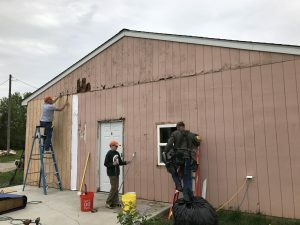 Rather than open the doors and expose the barn, and ourselves to the weather, it was decided to call it a day as installing the girts should take very little time. This is what the wall looked like before we scabbed some sheathing on it to keep the weather, and hopefully the critters, out. If you are interested in watching the time lapse of our work on Wednesday or my recap of Thursday’s progress you can find them in the videos below. 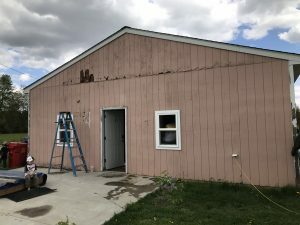 My dad and his friend are currently on their way over to the Homestead so we can begin the process of re-siding the front of the barn, and then I can re-paint it. It rained this morning but it has cleared up windy. Hopefully the wind isn’t too big a problem. Here is what the front of the barn looks like now. You can see where the siding is rotting in places. We were able to get two sheets put up, and hope to make a much bigger dent tomorrow. I recently watched a video by Jack Spirko talking about the need to have an email list to be able to contact subscriber/supporters. In the video he talks about how different media platforms all have one major flaw, you can be shut down at any time. YouTube, Facebook, etc. can all decide that your material is offensive, or receive a complaint against you and all your hard work can be erased. Now while I don’t think that would ever happen with my website or YouTube channel, I’d rather protect against it. Jack suggested an email list as an insurance policy of sorts. If something were to ever happen, the content creator would have the ability to contact their supporter/subscribers and let them know what happened and where they landed. If you are interested in watching Jack’s video, it is available here. To that end, I’d like to ask if you would be interested in signing up for my email list via the form below. I will never sell your email list or use it for anything other than contacting you to let you know what we have going on here at the Homestead. You can also keep track of what we have going on in video format at YouTube here.